Hi, I’m Evelyn and anxious to meet you and your household pets! I am retired from a career in Child Care and simply transferring my vast experience and nurturing spirit to the furry children in the family. 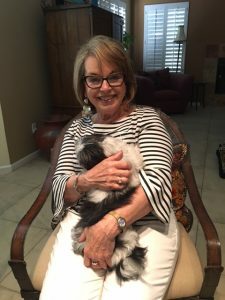 My former husband operates a mobile Veterinary practice and I often served as his assistant, so I bring additional qualifications to the wonderful job of pet care! I enjoy each opportunity to move into a Parent’s home and provide constant love and attention to the furry occupants, while also keeping your home safe and tidy. Can’t wait to meet you! Hope it’s soon.